I recently had an epiphany of sorts about a time in my life that I had long tried to forget. I’ve derided the Spider-Man “Clone Saga” so much on Chasing Amazing, that I’ll universally dismiss storylines that took place during this time period despite the fact that I haven’t actually read them in nearly 20 years. The “Web of Death” arc, which traverses Amazing Spider-Man #397-398 and Spectacular Spider-Man #220-221, is an early “Clone Saga” story I thought I disliked. It was advertised as the “final battle” between Spider-Man and Doctor Octopus, introduces the comic book world to Otto’s Chyna-like girlfriend Stunner, reveals Mary Jane is pregnant with Peter’s baby, and ends in the shocking death of Doc Ock at the hands of Peter’s demented clone Kaine. I was 13 years-old when I first read this story, and I think I got more caught up in the gimmicky nature of the arc (the “flip-book” two-in-one format, MJ’s pregnancy , the “first appearance” of a new character, and the “death” of one who had existed for more than 30 years) that I actually never paid too much attention to the story that’s being told by J.M. 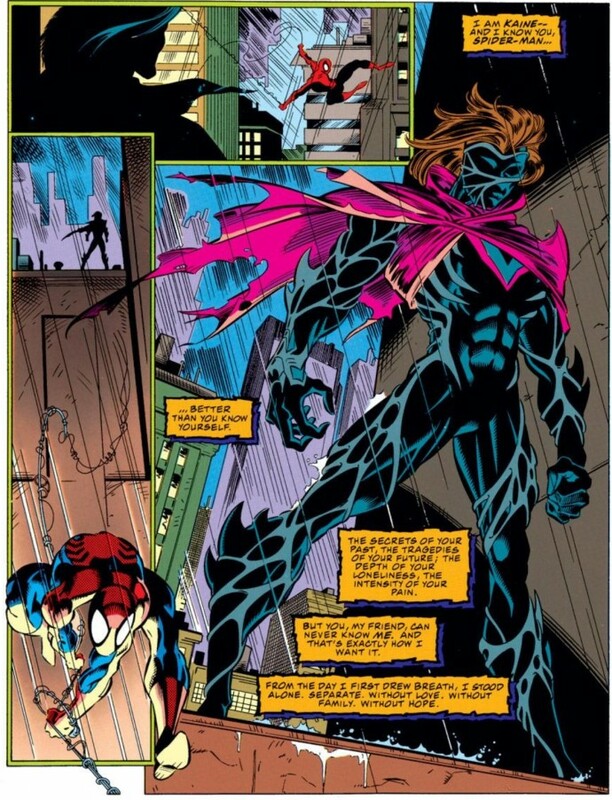 DeMattteis and Mark Bagley (in ASM) and Tom DeFalco and Sal Buscema (in Spectacular). As such, I instinctively buried “Web of Death” as being token 90s junk. That’s when the recent “Sibling Rivalry” arc in Superior Spider-Man Team-Up/Scarlet Spider inspired me to give “Web of Death” another chance with a fresh perspective. Re-reading “Web of Death” has made me realize that I’m being a little unfair about this era of comics. I’ve already admitted how much I love ASM #400, but when I was writing my “top 10 single issues” list earlier this year, I regarded this issue as the exception to the rule: the blooming red rose in a pile of creative manure. But that’s just not true. There were some very good, gripping Spider-Man storylines in the mid-90s that involved clones and other “gimmicks” of the era. “Web of Death” is one of them. Marvel didn’t do itself any favors by undoing all of the “momentous” reveals/plot developments of “Web of Death” after the fact – namely Otto’s death (he’s resurrected a few years later by the Hand) and MJ’s pregnancy (the baby is lost/miscarried/stolen by the resurrected Norman Osborn). But “Web of Death” is a prime example of how a storyline can still be appreciated as “great” as long as it is executed well – regardless of whether or not the events that transpired within the arc went on to have a long-term impact on the series. What I find so engaging about this story is the characterization of Doc Ock, and his interplay with Spider-Man/Peter Parker. JMD and DeFalco both explore Otto’s unquestionable connection to Spider-Man. Otto recognizes that Spidey is his greatest foe, and that the preservation of that dynamic may be more essential than actually ending the relationship (or “the dance” as Otto refers to it) via death. 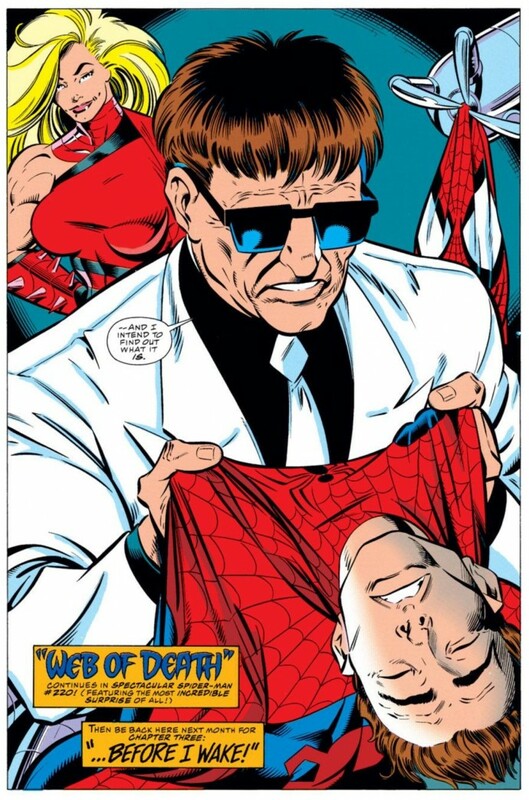 It’s because of this recognition, and how sincere Otto is portrayed by the writers, that I totally accept that he would go to such lengths to “save” Spider-Man, who was poisoned by the Vulture in an earlier issue of ASM and seemed to be running on borrowed time. It’s not that an egomaniac like Doc Ock doesn’t want to stand triumphant over his mortal enemy, but he wants to do it on his terms. 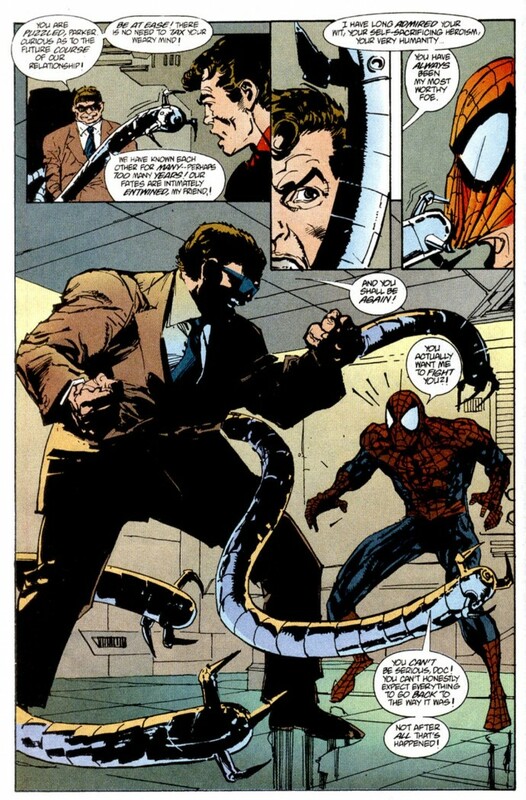 I also appreciate just how aware Doc Ock is of his opponent’s personality and traits. When talking with Stunner, he keeps repeating how much he respects Spidey and inherently knows that something is “off” when Stunner is able to physically subdue Spider-Man without much of a struggle. Doc Ock and Spider-Man have a ton of history together, and this storyline embraces that history (and even makes a reference to Otto unmasking Spidey in ASM #12) all in an effort to build to that shocking finale. In the midst of all this, Mary Jane returns to New York after having walked out on Peter (who’s been incredibly distant and isolated since he learned that the Chameleon and Harry Osborn/Green Goblin faked the return of his parents during the “Lifetheft” storyline in ASM). The cover to Spectacular #220 leaves nothing to the imagination – how can we not know that MJ’s big news is a baby given the years of “baby announcements” we’ve all consumed via television, movies and books? But given Peter’s dire situation, the pregnancy reveal lands so bittersweetly, it’s impossible not to feel such sorrow for the couple. Peter’s has long measured his life as Spider-Man against his failures with Uncle Ben, Captain Stacy, Gwen and others. Here, he is given a moment where he should feel nothing but joy and adulation, but he’s on the brink of death. Still, Peter tries to carry on as if nothing is wrong, which makes the whole development that much sadder. That’s when Peter realizes his only chance for a storybook happy ending comes at the hands of one of his most sadistic and violent enemies. And even reading this story all these years later, that moment of revelation resonates as being so utterly depressing – and gripping – to me. I love how DeFalco writes Otto in Spectacular #221. We have Peter traveling to the light, resigned to finally let go of all the pain and anguish that living on Spider-Man has caused him, and then there’s Otto, desperately trying to bring him back and save him. But in typical Doc Ock fashion, he’s fueled by hubris – his desire to not be a failure. He’s almost angry at the fact that the antidote he gave Peter eliminate the poison, but put Spidey into cardiac arrest anyway. Then, as if he wasn’t already a self-centered creep, after saving Spider-Man, he sets himself up to be arrested, so he can break out of prison one more time to fight Spider-Man, thereby continuing their “dance.” Spidey finds the whole thing absurd – how can he fight the man who just saved his life and allowed him to one day see his child? But Otto sees their relationship as being something “bigger” than matters of life and death. I find this moment especially striking in the context of the current Superior Spider-Man status quo. For years, comic book fans could argue about who was the TRUE arch nemesis to Spider-Man: Green Goblin/Norman Osborn or Doctor Octopus? Green Goblin caused more personal grief and pain for Peter/Spider-Man than any other villain in the hero’s rogue’s gallery. But its stories like “Web of Death” that always bring me back to declaring Doc Ock as the “number one” villain. When I read a Green Goblin/Spider-Man story, I never get a sense that the two characters “need” each other. The Goblin goes mad because Spider-Man continues to thwart his plans of criminal dominance and eventually unmasks him which allows him to attack Peter in ways other villains can’t. When Norman is eventually resurrected, he continues to torment Peter, but also takes on bigger fish in the Marvel universe like the Avengers and S.H.I.E.L.D. But Otto NEEDS Spider-Man to be relevant. And Dan Slott brings this idea full circle with the Superior concept. A dying Doc Ock needs Spider-Man so badly, he finds his only option is to become him. And when he does assume the mantle of Spider-Man, he doesn’t want to use that power to take over that world. He wants to prove that he’s an even BETTER Spider-man than Peter. When Otto challenges Spidey in Spectacular #221, he wants him to rest up so he can be at full strength for their eventual confrontation. I’m fascinated by the fact that one villain can be written so consistently, with such nuance and eloquence over the span of multiple titles and writers (and years). Given that Slott is such a continuity buff, I have to imagine an arc like “Web of Death” factors into how he constructs Superior Spider-Man. 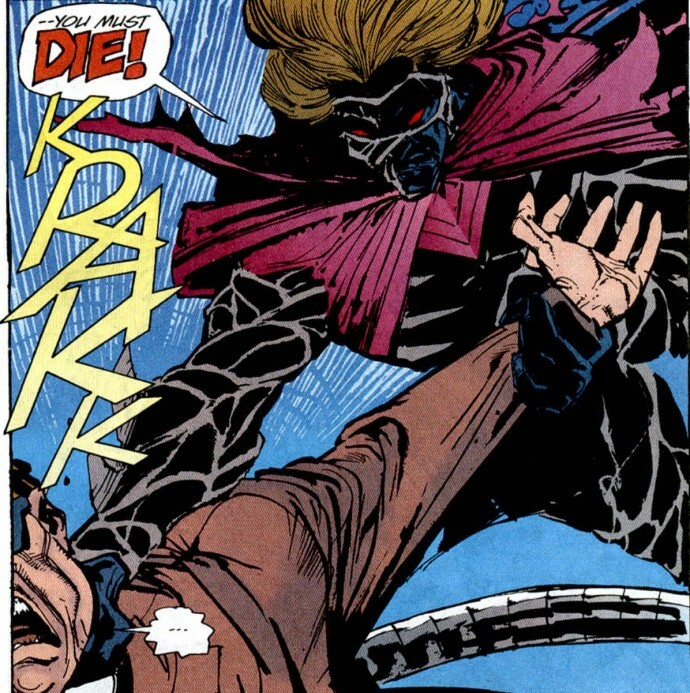 That Kaine comes in and suddenly (and brutally) kills Doc Ock before he ever gets a chance of realizing his fantasy of saving Spidey’s life in order to defeat him on his own terms, is simultaneously poetic and maddening. “Web of Death” is building and building, like a runway train, to this one big moment and in one sickening instant, Kaine stomps his foot on its throat and chokes the life out of it. JMD and DeFalco successfully condition the reader to want to see Otto go out on his own terms, and this sick, demented creature that we know nothing about refuses to play nice with more than 30-years of comic book history. My recent re-read of “Web of Death” has me thinking about doing something that was unfathomable a few years ago: I think I need to re-read, or in some cases read, the entire “Clone Saga” to see if it’s as horrible, awful, terrible, etc. as I remember it being. As my personality has mellowed over time, I’ve realized that my distaste for the whole story wasn’t so much the fact that Peter was labeled the “clone” and Ben Reilly (for a brief time) was the “true” Spider-Man. It was the fact that the story went on for years, across multiple titles, forcing me to follow a weekly over-the-top drama in order to know what was going on. 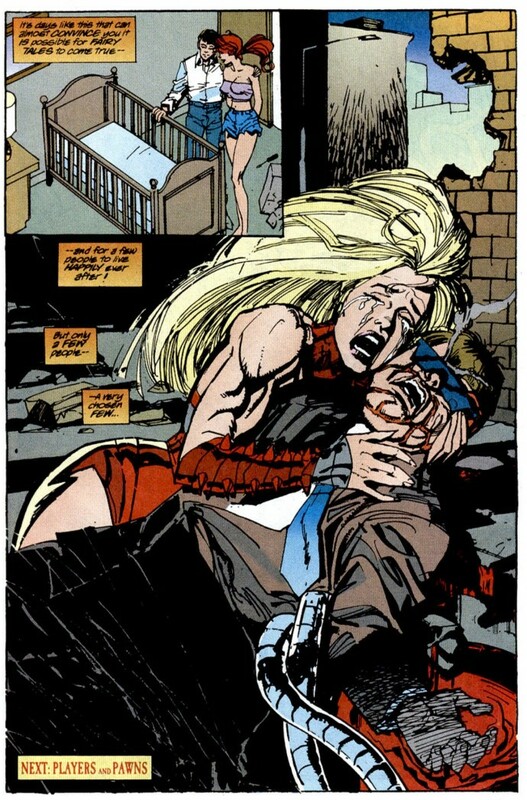 To this day, that’s just not how I like to consume my comic books. I had a hard enough time keeping up in the mid-2000s when Marvel was publishing ASM three times a month. But stories like ASM #400 and “Web of Death” demonstrate that the “Clone Saga” couldn’t have been that bad. So now, rather than continually rail against that era, or stick my fingers in my ears and scream “la la la” like I’ve noticed some other Spider-Man bloggers have done in their reviews of “Sibling Rivalry,” it’s time to be read these comics as a grown-up, like a grown-up. 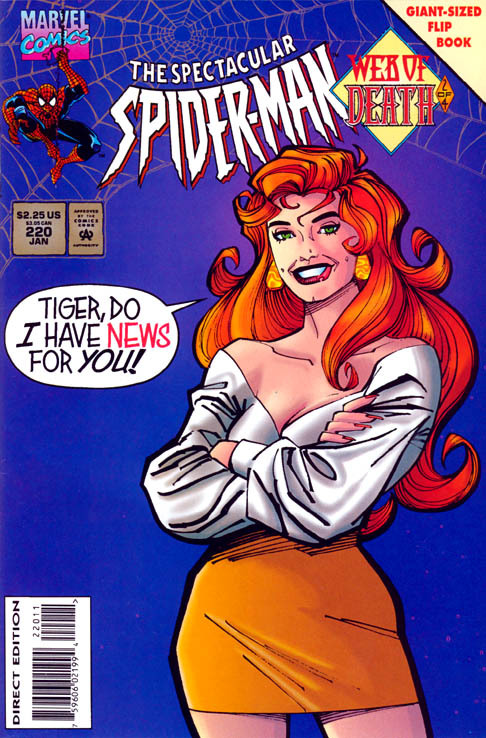 I actually read this a week or so ago as part of my slow, depressing crawl through the Clone Saga. You may know the answer to this but by this point was Kaine an established character? Because at the same time this story was released over in Web of Spider-Man and Spider-Man they were doing Web of Life. And while I also think that was the high point characterization wise or Scarlet Spider to that point, it also hits a lot of the same beats. Hero on the ropes, Kaine lurking and being foreboding, and then Kaine killing a villain, in this case Kraven’s son. It really seemed like for two months Marvel was trying to establish Kaine as a threat. Now Web of Death is all around better than Web of Life, but if you’re looking back on why you may not have been high on this at the time that could be why. Also I had the same thoughts about Slott pulling a lot from this, and now Stunner showing up in solicits kind of confirms that.